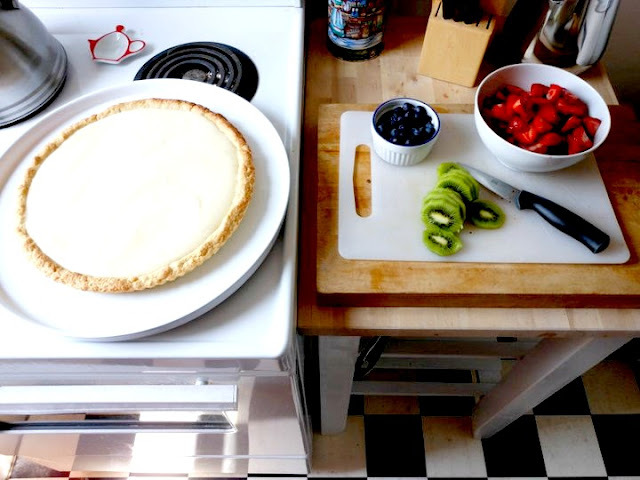 The Kitchen Boudoir: To (S)tart. To acquaint myself with blogging practice, and while I wait to get home to have access to more recent photos and posts, I wanted to upload and share some pictures of a tart I made this summer. Consider this a dry (but actually quite moist and very delicious) run! 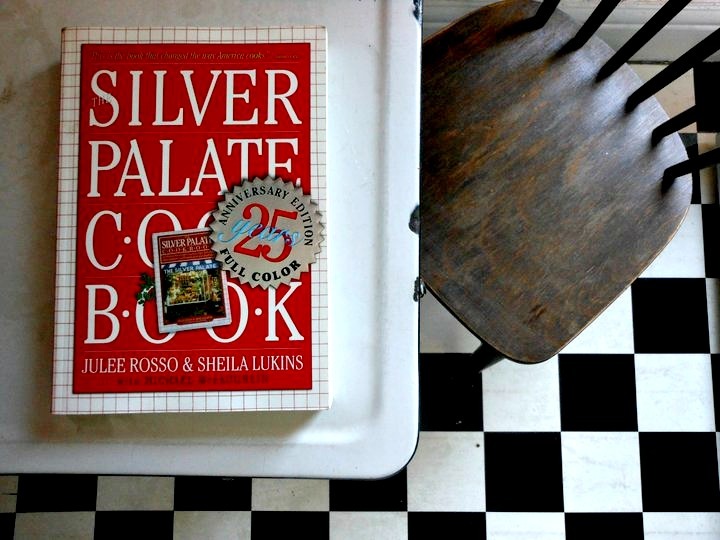 I made this recipe from one of my go-to cookbooks, The Silver Palate Cookbook. The recipe asks for a pastry cream - something I had never attempted before. 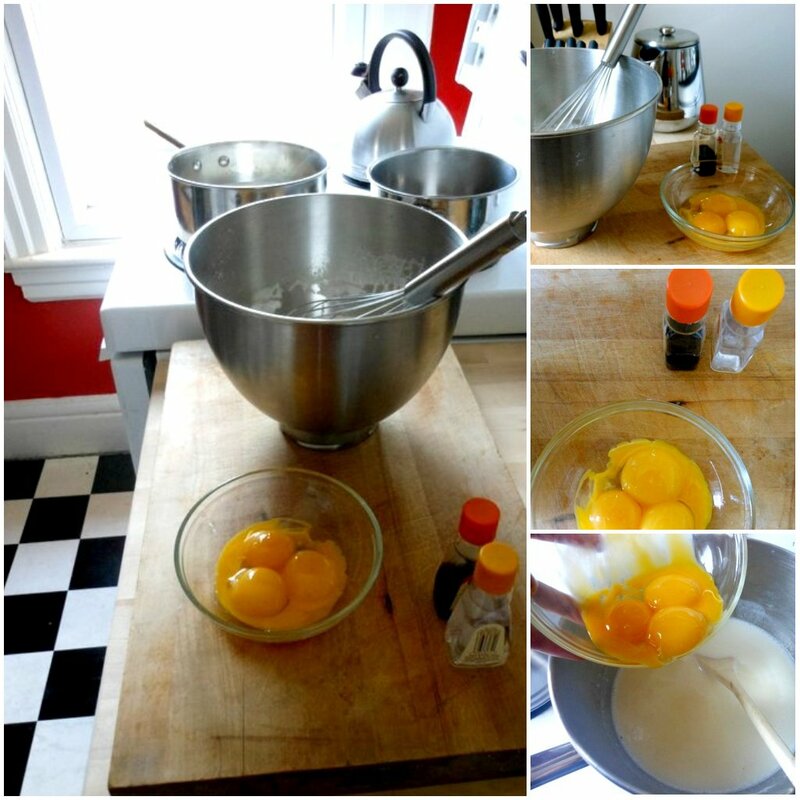 Milk, sugar, eggs, vanilla, whisked on a double boiler until deliciously thick and creamy. I am a huge fan of shortcrust, especially the part where you get to smear the dough on your work surface to make it come together. Smear. Great word. There is something so intimate in relating with pastry. It's like any thing you try to make come together...you have to love it and whisper to it and touch it in just the right way for just the right amount of time with appropriate periods of rest in between. After chilling, I rolled the dough to fit a new-to-me but vintage 13" tart tin I found in the very back of a shelf at my local hardware store. This store is the kind of magical place where it's bursting at the seams to the point of quaint chaos with things that are necessary and useful and things that have been there since 1973, dust included. It's part of the charm. Shortcrust, meet pastry cream. I imagine you'll get along very well. 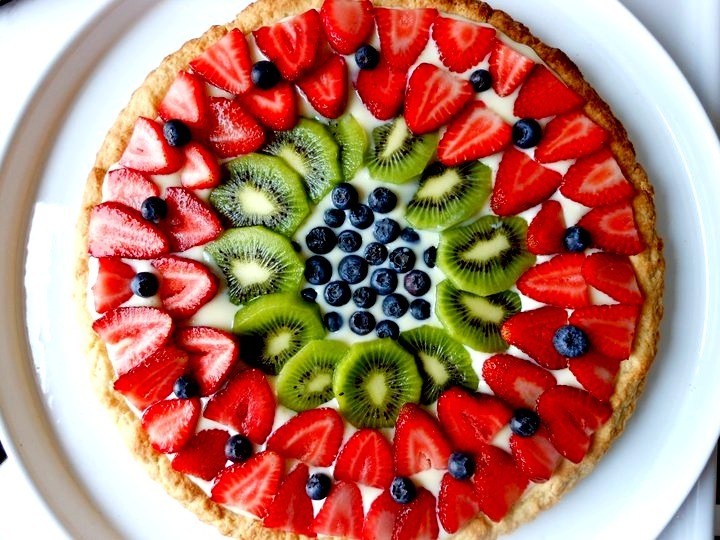 Beautiful...now the fun part of making a fruit tart - you can top it with whatever kind of fruit you like. I went with organic strawberries, blueberries, and kiwi - and loved that there were three different colours to play with. And here's the deliciousness that resulted from that play! More fun was had setting some apricot preserves to bubble and liquify to make a sweet glaze for the fruit. This recipe makes enough dough for an 8" or 9" tart pan. I doubled the recipe to make enough for my larger tart pan and used the leftover dough to make some mini butter tarts - will have to post about those sometime. A world without butter tarts is not a world. Using your fingertips, a pastry blender, food processor, stand mixer, rub the butter into the flour mixture until it resembles coarse meal. For those of you for whom coarse meal is not a dietary staple, this is what it looks like. Combine the remaining wet ingredients and add to the flour/butter mixture to make a ball, using a quick stir with a fork, or buzz of your machine of choice. Do not over-mix - your pastry will get cranky. Place the ball of dough in the centre of a sheet of plastic wrap or waxed paper. 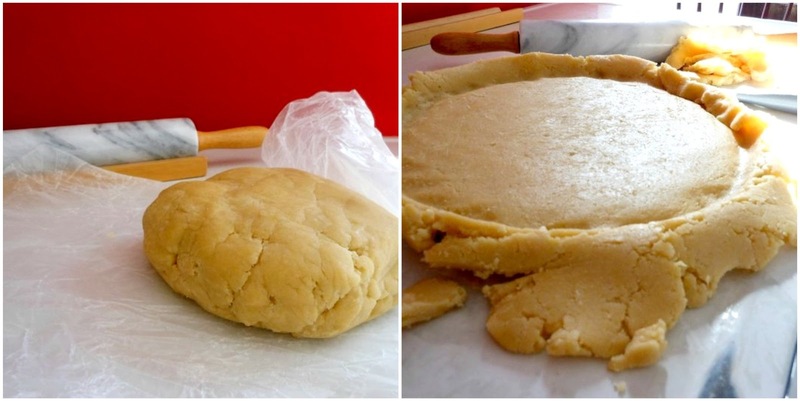 With the heel of your hand, smear about 1/4 cup of the dough away from the centre and repeat until you've smeared the entire ball across your sheet. Using the wrap/paper, reform the dough into a ball, wrap fully and chill for 2-3 hours. Roll out the dough between 2 sheets of waxed paper or a well-floured pastry cloth, working quickly as the dough gets rather sticky when handled. Line your 8" or 9" pan loosely, trimming it so that you have about a 3/4" overhang. If you do not have a pan with a removable bottom, you can line the bottom with a circle of parchment, cut to size. Gently press the dough in to fit the sides of your pan, folding and pressing the edge of the overhang over towards the inside. Cover and chill. 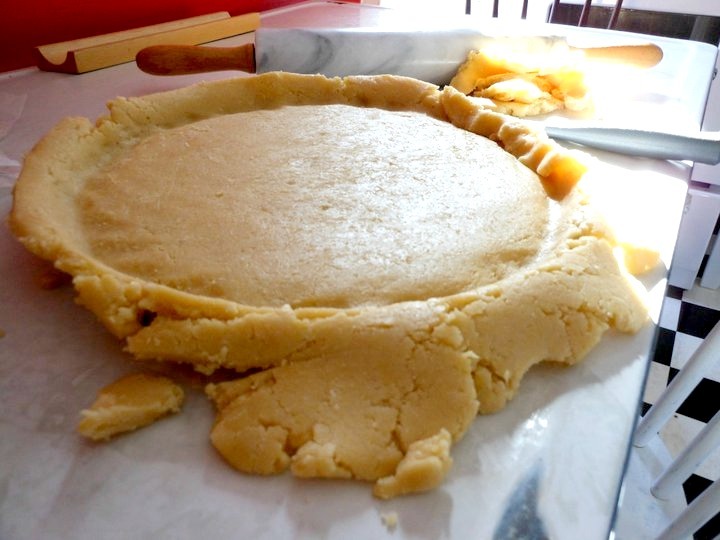 Line the tart dough in the pan with aluminum foil or waxed paper and weigh it down with uncooked beans or rice. Bake for 8 minutes. Remove the foil and prick the dough with a fork (baking term FYI - this is called docking) and let bake for another 8-10 minutes, or until the edges are a light golden brown. 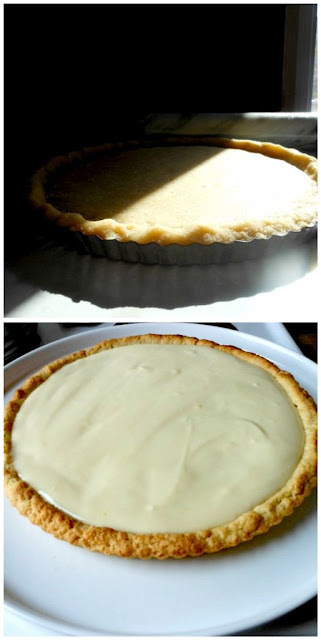 Allow to cool to room temperature before assembling tart. Yields ~ 2 1/2 cups pastry cream. 2 TSP extract-of-choice vanilla is classic, but I think almond would be nice here too. I actually used 1 TSP vanilla and 1/2 TSP coconut extract. Scald the milk in a heavy-bottom saucepan. While the milk is warming up, whisk the sugar and flour together in a stainless steel or ceramic bowl. Remove the skin that forms on the milk and pour into the sugar/flour mixture, setting the bowl over a saucepan of simmering water. Stir this until the mixture lightly coats the back of a spoon, about 10 minutes. Add the egg yolks and continue cooking, stirring constantly, until the mixture heavily coats the back of a spoon, about another 10 minutes. You can do the classic custard finger test here to know exactly the right moment to remove from the heat. Remove the pan from the heat, adding the butter and vanilla and mix well. Cover the top of the cream with plastic wrap to prevent a skin from forming, then chill in the fridge once the mixture has cooled a bit. When the pastry shell has cooled completely, carefully remove it from its pan to a serving platter. Fill with pastry cream (an 8" or 9" crust will take about 1 1/2 cups of the pastry cream), keeping in mind that when fruit is placed on top, the cream filling raises slightly. Decorate with the fruit(s) of your choice, in a pattern of your choice so that it covers the entire tart surface. It is wonderful and fun to experiment with fruits of different colours to create that stained-glass effect. 3 TBSP jam or preserves of your choice. I used apricot - cherry, red currant, strawberry, passionfruit, guava, would also be delicious and your preserve could be catered to the flavour profile of the fruit you use for your tart. 1 TBSP liquid - I used water. You could also use kirsch, or a brandy or cognac of choice if desired. Fruit juice would work too (although I would avoid orange or grapefruit). Whisk the jam/preserves and liquid in a small saucepan over medium heat until smooth. I used a pastry brush to distribute the glaze over the fruit, but spooning it over would work just as easily. I know I am posting a summer recipe in the dark, cold, blank days of January, but perhaps it brought some summery thoughts your way. This tart is custom-made for summer afternoons - It's perfect eaten out-of-doors, but I assure you, it tastes how summer feels, so feel free to eat it anywhere and any-when. I'm hungry and a little turned on after reading this post! (I have a feeling that will be a common reaction to your lovely new blog!!) Congrats on getting it going. I can't wait to taste one of your creations!!! That's exactly what I like to hear! And yes, for the sake of my waistline and the fact I live alone, I'll be needing willing tasters. Consider yourself officially on the roster! Tarts are an amazing dessert. They are fun to make, delicious and have a stunning presentation. Yours does look to be a winner and you made some excellent choices for the fruit on top. Delicious post! Thanks Tina! Tarts are a definite favourite of mine. I am currently doing the 'difficult' job of seeking out the best butter tart recipe. Do you happen to know of a good one? If so, I'm keen to try. This looks amazing! I think it might adapt well to reduced sugar too. Looking forward to making this. Yes, the fruit really shines with its own natural sweetness. Let me know how it works out! i wish you had a pinterest link below the post. i would pin it with my recipes. why not? it would bring traffic to your site. and you are on pinterest and have every other social media link below the post. nice site!